*** Disclosure: I was given a copy of Motherhood Realized to review. I was not compensated in any other way. All opinions expressed here are my own. Motherhood is hard. It's thankless, it's messy, it's monotonous, and it's often derided as unimportant. Deliberate mothers know better. We know that being a mother is one of the most important jobs we can do, and brings us joy and peace (yes, peace!) in a way nothing else can. Still, we all face stress, challenges, and moments where we just want to throw our hands up in the air, walk out the door, and never look back (at least not until we've had a few hours away!) What do you do in those moments? If you've been reading my blog this year, you know I've been singing the praises of Deliberate Motherhood, a book that changed the way I view parenting and made me want to be a better mother. I've even started a series focusing on one of its 12 "powers" each month. 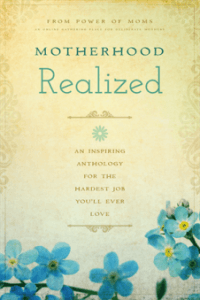 The online community behind Deliberate Motherhood has released a new book called Motherhood Realized. It is a series of essays, questions, and challenges to help you feel even more empowered and enabled to be a mother, appreciate your mother, or look forward to being a mother. You may have seen some of these essays floating around Facebook or Pinterest. I know many of my friends shared the article "Your Children Want You" in their news feeds. Mothers everywhere were thrilled to hear this message. Many of you were also emotionally touched by this account of one author and her cancer-stricken mother, entitled "Worth Fighting For." I was so happy to see these essays included in Motherhood Realized. Paraphrasing the book's introduction, this is the kind of book you can enjoy an essay, a chapter at a time, or read in chunks as you're searching for help and inspiration for your phase of mothering. The mothers in this book are real, and are in all stages of life. This is a book to buy and savor, with essays you will turn back to again and again. One of my favorite things about the book is that it gives you something to act on after you've read an essay. It asks you a thought-provoking question or two, then gives you a challenge to apply what you've read to your own life. I just might take this on as my next blog project after I finish my Deliberate Motherhood series! Ladies, mothers, we are not alone. We have each other. We are a great sisterhood of mothers who can strengthen and lift each other. This book doesn't replace the mom network you hopefully have in your real life, but it does give gentle reminders, sage advice, and needed encouragement in those moments where you might not have someone to turn to. It is truly sisterhood in book form! What's the hardest part of being a mom for you? What brings you the greatest joy? This article is very meaningful, it is a use value to me, thank you for posting this friend,welcome Thomas Sabo sale online - www.thomassaboaucheap.com I will be the first time saved and study of its own. Free Ballet Printable for your Ballerina!